If you’re a Globe subscriber you already know that they offer unlimited free Facebook internet access. Here’s good news for Smart users, all their prepaid subscribers can now enjoy UNLI FB browsing without any charge. Yesterday I visited their Twitter account and saw this news on their cover photo. You can now surf anytime you want as long as you still have remaining free MB’s on the daily allotted free 30MB. This promo is open to all Smart prepaid and postpaid subscribers, you’ll only need to maintain P1 balance on your account or active promo subscription will do also. You can now do important research, browse to your favourite social networking site like Instagram, Twitter and more daily. How to register Smart UNLI Facebook? That’s it guys, make sure to use those free MB’s wisely. Do note that this promo is subject to Smart policy. If you’re experiencing slow loading, please check your signal reception and network type, if it’s only G/E (GPRS/EDGE) then browsing is bit slower that 3G/4G network type. Network type may also vary on area and device you are using while subscribe to this promo. Like for example, you’re area has 3G/4G network type that listed on Smart website but your device is capable only for 2G network. In that case, you can only enjoy 2G internet speed due to your device. Charges may apply to p2p downloads and uploads, VOIP and messaging. 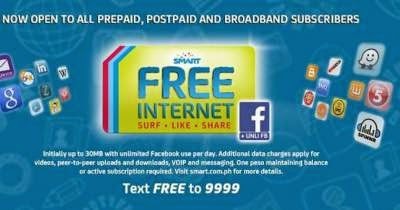 For updates of this offer you can visit Smart Communications website.